JGI’s work is distinguished by its participatory, systems-based approach, successfully mobilizing people to adopt new behaviors and practices to serve themselves and the broader landscape they rely on to survive. We apply this approach across multiple sectors, from agriculture and health to education and micro-credit. Since the early 1990s, The Jane Goodall Institute (JGI) has recognized that protecting chimpanzees and their habitat can no longer remain separate from the task of improving the human condition. Rapidly increasing destruction of forests and the pressures of growing populations mean that reaching individual farmers and villagers is key to conservation success. That’s why, in African chimpanzee range countries, JGI’s around the world work to build the capacity of rural communities to be self-sustaining in ways that enable them to prosper economically and culturally, while protecting the natural resources on which their long-term prosperity depends. JGI’s work is distinguished by its participatory, systems-based approach, successfully mobilizing people to adopt new behaviors and practices to serve themselves and the broader landscape they rely on to survive. We apply this approach across multiple sectors, from agriculture and health to education and micro-credit. Poachers in the Congo kill thousands of chimpanzees each year for the illegal bushmeat trade. Sometimes they spare the lives of the smallest, selling them as pets or for entertainment. JGIA works to end the illegal commercial bush meat trade through education and awareness programs, changing policy and community-centred conservation activities including development of alternate sources of protein. To help the youngest victims – the orphaned babies – JGI operates Tchimpounga, a safe haven in the Republic of Congo, where orphans who have been confiscated from the black market can get needed care and attention. Tchimpounga was founded in 1992 and today hosts more than 150 chimps and as of 2011 includes three islands where chimps live in near-wild conditions. See an inspiring video of Dr. Goodall releasing Wounda the chimp onto an island here. 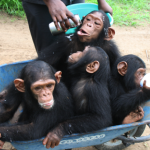 You can help us look after Anzac who’s an orphan at Tchimpounga by becoming a Chimp Guardian! Uganda has the highest school dropout rate in East Africa. Girls are particularly impacted in times of poverty, when their education is sacrificed and the cycle of poverty begins. Often when girls reach puberty, they leave school to marry or contribute to the household by assisting with tasks such as farming and water collection. This problem is compounded by a lack of access to reproductive health information and materials. When women are educated they are more likely to find employment, have a higher income and invest in their family’s future. And it only costs $100 to fund a girl’s entire high school education! Through this program we fund girls schooling as well as equip women with information on health and life skills who then share their learning with classmates. The program also funds materials such as pencils, pens and exercise books for girls whose families cannot afford scholastic materials, as well as hygiene supplies so girls won’t feel the need to stay at home during their menstrual cycle. 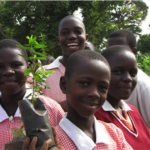 The peer-to-peer education program is based in schools that currently or are willing to participate in Roots & Shoots. This helps to build youth leaders who have the skills and tools to initiate community projects to help people, animals and the environment. Before the introduction of JGI’s peer-to-peer education program, in most schools an average of 20 girls completed grade seven. With the introduction of the program, now an average of 35 girls attend grade seven in each school. A large portion of the program’s success is due to its work to educate parents about the benefits of girls’ education. Thanks to the peer program, young women have also learned that education is their right and are more confident and motivated to assert their right to go to school. At JGIA we also raise money to fund women’s projects to create income. Not only does this stop women from practices such as unsustainable farming or firewood collection and sale (deforestation), it also gives them a higher income which they can spend on educating their children. This is critical in breaking the cycle of poverty. When women are educated and have an income source, they also tend to have less children, which means women are better able to provide for their families and the environmental impacts are lower. 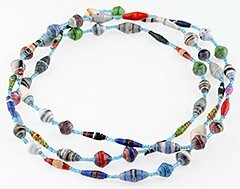 To support these women, please purchase a bead necklace or bracelet made by women in Uganda from our JGIA shop.